Shalom! My name is David Baum and I am honored to serve as the Rabbi of Congregation Shaarei Kodesh. "My sacred task as rabbi is to ignite the God-given hidden spark (Or HaGanuz) within each person, and connect this light to others through building spiritual community. The tool of ignition, inspiration, and agitation is our Torah, 70 Faces and all, and my task is make Torah come alive (through diverse venues) in the present so it will live in the future. I seek to be a madrich/guide and leader who can help others traverse through the windy pathways of life. I strive to connect to my congregants and students through our stories, finding each other within our own narratives and journeys." 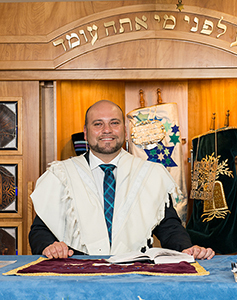 Rabbi David Baum has served as Rabbi of Congregation Shaarei Kodesh since the summer of 2009. Rabbi Baum graduated from the Rabbinical school at The Jewish Theological Seminary and received his Master’s Degree in Jewish Education from the Davidson School in May 2009. Rabbi Baum was born and raised in South Florida attending Conservative Synagogues in both Miami and Plantation, Florida. During his childhood, Rabbi Baum was very involved in his synagogue, serving as president of his USY chapter. He attended the University of Florida where he graduated with a Bachelors degree in Psychology and a minor in business administration. While at school, he engaged in leadership roles at the University of Florida Hillel and with Koach, the Conservative Movement’s college outreach movement. During his summers at school, Rabbi Baum worked at one of the Conservative Movement’s summer camps, Ramah Darom, the center for Southern Jewry. Rabbi Baum spent nine summers on staff at Camp Ramah Darom working closely with one of his mentors, founding director, Rabbi Loren Sykes. Before entering rabbinical school, Rabbi Baum spent a year in Jerusalem learning at the Conservative Yeshiva. He has enjoyed many diverse opportunities as a student where he found his Rabbinic voice including working as a student Rabbi in Norwalk, Connecticut and in Fitzgerald, Georgia; working as a teacher in both Hebrew schools and adult education programs; developing his passion for social justice through his involvement as a Seminary Summer Intern with Interfaith Worker Justice and The Seminary Leadership Project through the Jewish Organizing Institute and Network (JOIN for Justice); working as a program director for a teen interfaith program at Auburn Theological Seminary; and returning to the University of Florida where he served as a campus rabbi during his final year of Rabbinical school. Locally, Rabbi Baum is the immediate past President of the Palm Beach County Board of Rabbis, past president of the Southeast Region of the Rabbinical Assembly, and serves on the board of directors for the Levis Jewish Community Center of Boca Raton. Nationally, Rabbi Baum sits on the Rabbinical Assembly’s Social Justice Commission, is co-leader of the Rabbinical Assembly’s Resolution’s Committee, and has presented at various national conferences including JOIN for Justice’s first-ever national conference, the Jewish National Fund’s national conference in 2017, and two Rabbinical Assembly conventions. Rabbi Baum was one of 19 rabbis to participate as a Clergy Leadership Incubator (CLI) Fellow in its second cohort. The two-year program supports and encourages rabbis serving congregations or other new models of spiritual community in the areas of innovative thinking, change management, and institutional transformation. The Clergy Leadership Incubator (CLI) is a two-year program to support and encourage early career congregational rabbis (years 2 to 10) in the areas of innovative thinking, change management and institutional transformation. Rabbi Baum was married to his wife Alissa in August 2006, shortly before they spent a year in Jerusalem. Alissa was also born and raised in South Florida and has completed her doctorate in clinical psychology from Nova Southeastern University. Dr. Baum is currently working at the Renfrew Center, an eating disorder treatment facility, in Coconut Creek, Florida. They are the proud parents of two boys and a girl, Avraham (Avi) Jacob, Harrison Eytan and Layla Eden.